Gary Haugen's book, Good News about Injustice, can help concerned Christians not only face injustice but also become a part of the solution. As a former worker in the civil rights division of the U.S. Department of Justice, former director of the United Nations genocide investigation in Rwanda, and current president of the International Justice Mission, Haugen draws from his vast experience. Good News about Injustice does not list every injustice in history; nor is it a theoretical text exploring God's role in evil and suffering. 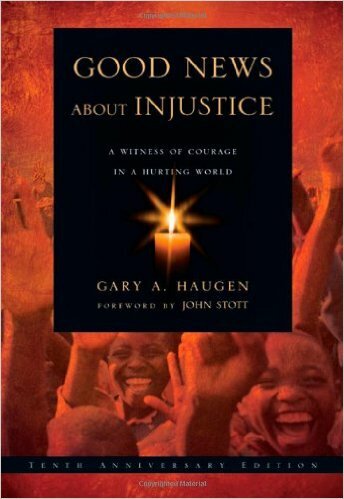 Haugen's book does some of both, but more importantly, he creates space for readers to imagine themselves involved in God's plan to bring justice to the oppressed. Haugen begins his book in Rwanda after the massacre of Tutsis in April 1994. While working to confirm the testimonies of witnesses of the massacre, Haugen spent time collecting information in mass graves. He recognized the temptation to depersonalize the horror of what happened in Rwanda: "These mass graves might appear as vague, dark images of generalized evil in an unjust world, but in truth they were an intimate family portrait with a story for every face—each member of the human family having lived and died as one individual at a time" (pg. 29). Haugen outlines what we can understand biblically about God and his relationship to injustice in his book. In a nutshell, Haugen points out that we can find hope in the fact that God is a God of justice, compassion and moral clarity: He will rescue us. Haugen uses the Bible and real-life examples to illustrate and solidify his claims, and he makes it clear that God's people play an important role in making justice a reality. Haugen writes: "If you think about it, two truths apply to everything that God wants accomplished on earth: (1) he could accomplish it on his own through supernatural power; but instead, (2) he chooses for the most part to limit himself to accomplishing that which he can achieve through the obedience of his people" (97). Haugen has found that coercion and deception are two components present whenever injustice is perpetrated. In his book, he not only demystifies injustice through a process of naming and explaining the fundamental tools people use to propagate injustice, Haugen also demonstrates practical ways to investigate injustice based on whether coercion or deception is employed in the process of victimization. Additionally, Haugen analyzes how to choose interventions and apply different methods to help bring justice to those who have been oppressed. The interventions he explores range from spiritual intercession to legal sanction and even public shame. Haugen ends his book with a much-needed reminder that we are a part of the body of Christ and that together we can accomplish much more than we can individually. God calls people to many different vocations: shepherds and teachers, frontline workers, country and culture experts, public justice professionals, international business people and professionals, and storytellers and communicators. Haugen's book can help empower all of us to work together so that God's justice is manifested in this troubled world.